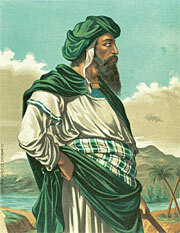 There have been depictions of Mohammed in every era and in nearly every country in the world. This "Miscellaneous" section of the Archive encompasses Mohammed depictions from periods and locations not covered in other categories. In 1928, Liebig's Extract of Meat Company (a German firm which had developed concentrated beef extract and bouillon cubes) issued a series of advertising trading cards to promote its canned beef extract products. 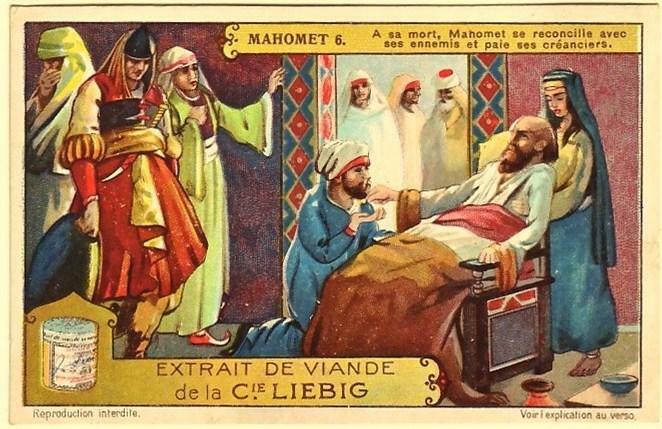 The 1928 card set (one of hundreds of different designs issued by the company over the years, on various themes) illustrated six different pivotal points in Mohammed's life. 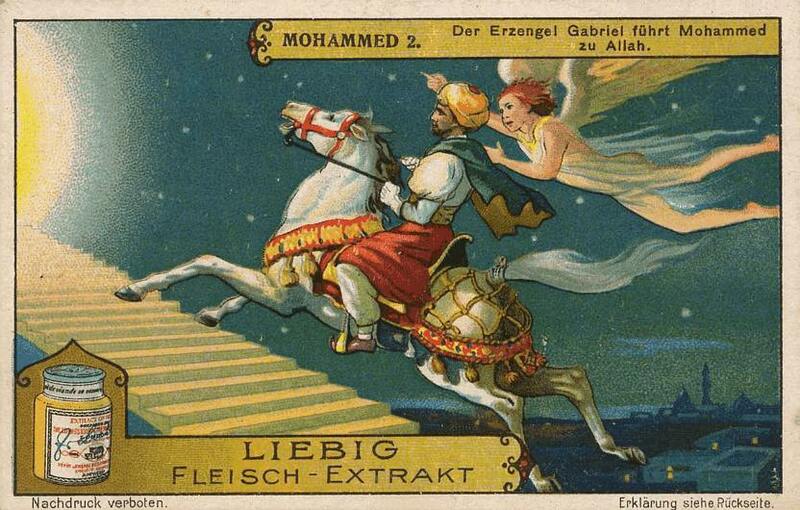 The most beautiful of the cards was the second one, seen here, which showed the Archangel Gabriel escorting Mohammed up to the presence of Allah in Paradise -- the climax of his legendary "Night Journey." The full set of all six cards are visible near the bottom of this page. A cigarette card showing an artist's impression of Mohammed, manufactured by the Ogden Cigarette company, printed sometime around the turn of the 20th century. 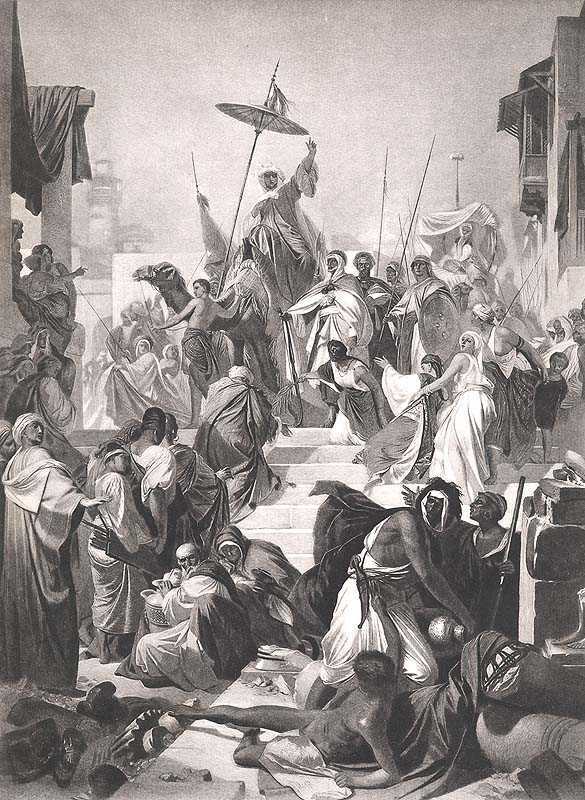 Mohammed at Mecca, by Andreas Muller, late 19th century; this is a photogravure reproduction printed in 1889; the original is in the Maximilianeum Gallery, Munich. Mohammed is the one on the camel, and is depicted casting the idols out of the Kaaba. Certain towns in southern Spain hold an annual festival called "Moros y Cristianos" ("Moors and Christians"), which celebrates the Reconquista -- the recapture of the Iberian Peninsula by Christian Spaniards from the Muslim colonizers who had invaded centuries earlier. In some locales, at the climax of the festival, townspeople burn Mohammed in effigy. 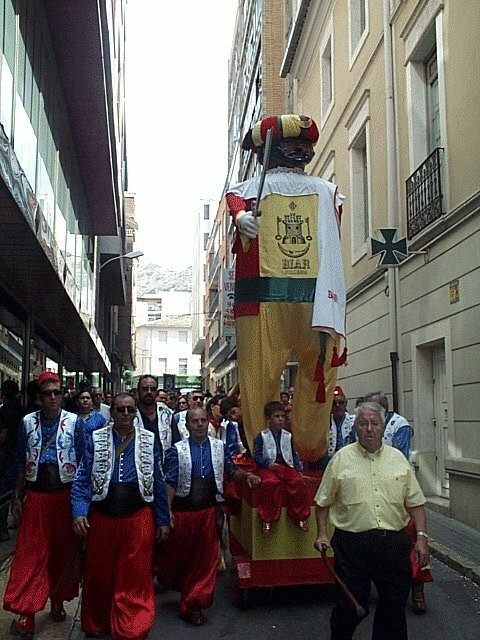 The Mohammed figure, called La Mahoma, is usually bigger than life-size and in full costume. The picture here shows La Mahoma from the 1920 Moros y Cristianos festival in the town of Biar, near Alicante. But according to this site, some of the villages are planning to tone down their celebrations this year by not having La Mahoma at all. And artists in the city of Valencia are now afraid to make sculptures that mock Mohammed in their annual satirical Fallas festival. 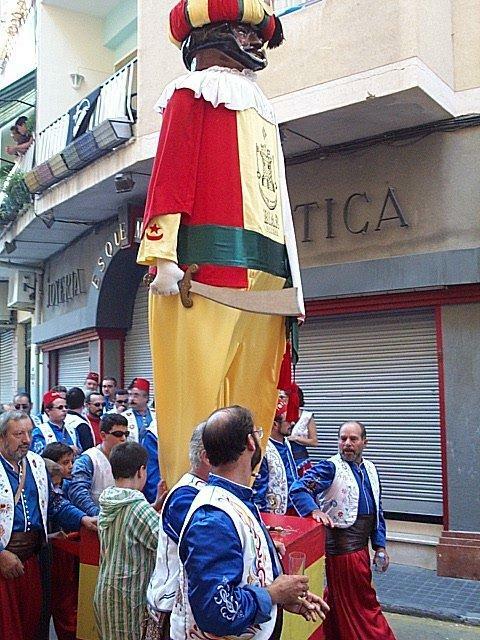 A photo essay on this site shows La Mahoma of Biar being paraded through the town in the 2000 Moros y Cristianos. A municipal fraternal organization maintains the tradition of La Mahoma from year to year. On September 25, 2006, the Berlin opera house Deutsche Oper cancelled scheduled performances of Mozart's opera "Idomeneo" out of fear that Muslim extremists might commit acts of terror in response to the production. 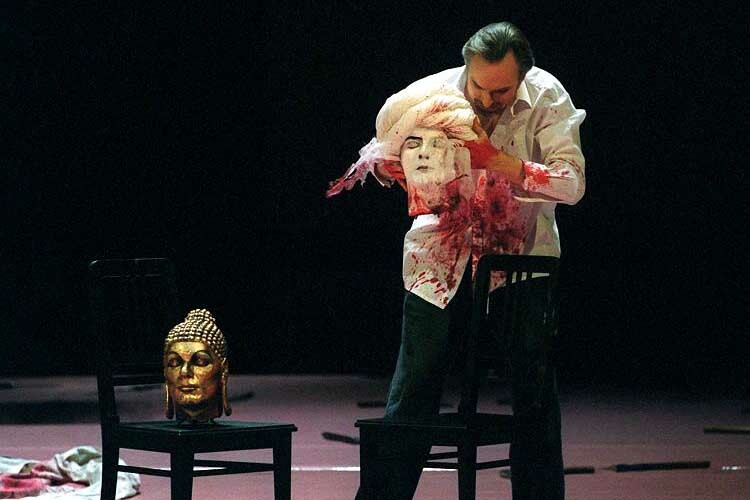 The original Mozart score made no mention of Mohammed or Islam, but the contemporary German version -- first performed without incident in 2003 -- shows a character displaying the severed heads of four religious figures: Poseidon, Buddha, Jesus and Mohammed. The picture shown above comes from a 2003 rehearsal of the opera. 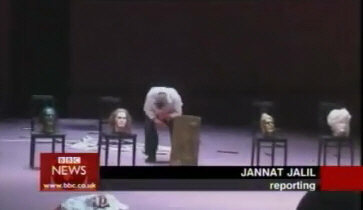 These two additional images of Mohammed's head in "Ideomeneo" come courtesy of the Drinking From Home blog; the photo on the left shows an actor playing Mohammed before his head is removed; and the other picture shows Mohammed's head sitting on a chair on the right. 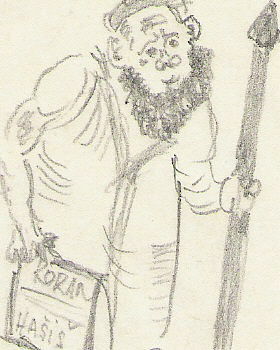 This contemporary drawing of Mohammed is a thoughtful attempt to show what he might have actually looked like in real life, based on scholarly research into the earliest known descriptions of him, and into the type of clothing worn in Arabia during his lifetime. 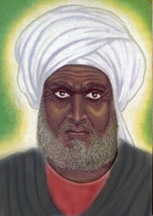 This unusual drawing of a dark-skinned Mohammed comes from a site about Factology, an obscure messianic Islamic-themed schismatic religious group which is based on the teachings of Dr. Malachi Z. York. 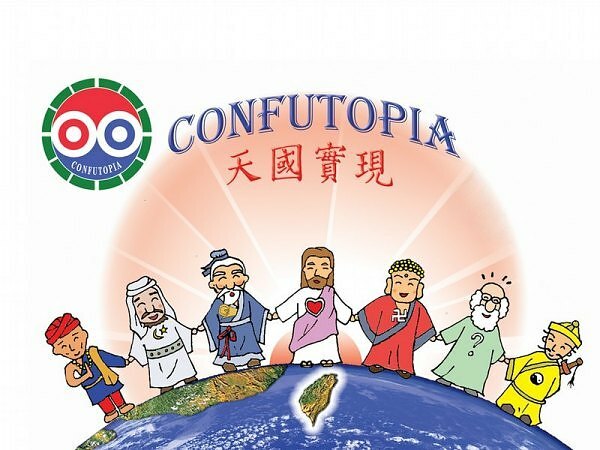 This advertisement for Taiwan's "Confutopia Church" (a combination of "Confucius" and "utopia") shows Mohammed holding hands with a pantheon of historical spiritual leaders. 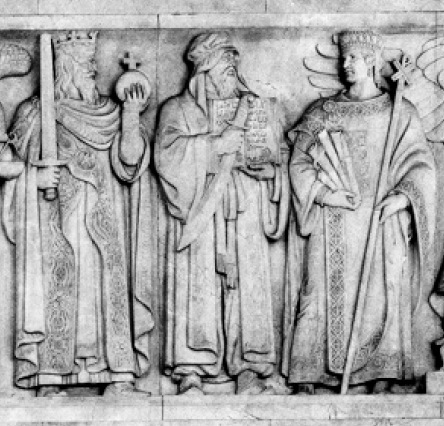 The figures, from left to right, are: A Taiwanese aborigine, Mohammed, Confucius, Jesus, Buddha, Socrates, and Lao-Tzu. (The first figure might instead be Krishna -- it's not clear). Zombietime reader David B. also sends these photos of Confutopia members performing at Hsuan Chuang University in 2008. The group photo features students portraying (from left to right): Lao-Tzu, Buddha, Socrates (with question mark), a fan, Confucius, Jesus, and Muhammad. The large photo on the left is a close-up of the actor portraying Mohammed; notice the golden crescent and star (the symbol of Islam) on his chest, despite his odd headgear. The second photo shows the same actors doing a hip-hop dance performance; the photo on the left is a close-up of Mohammed dancing. 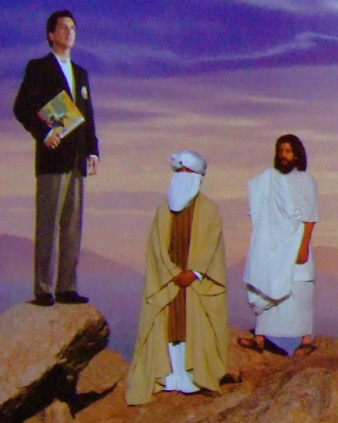 This picture from a Scientology book for volunteer ministers is quite similar to the Confutopia image (seen above); both show Mohammed as one among several famous spiritual leaders throughout history. 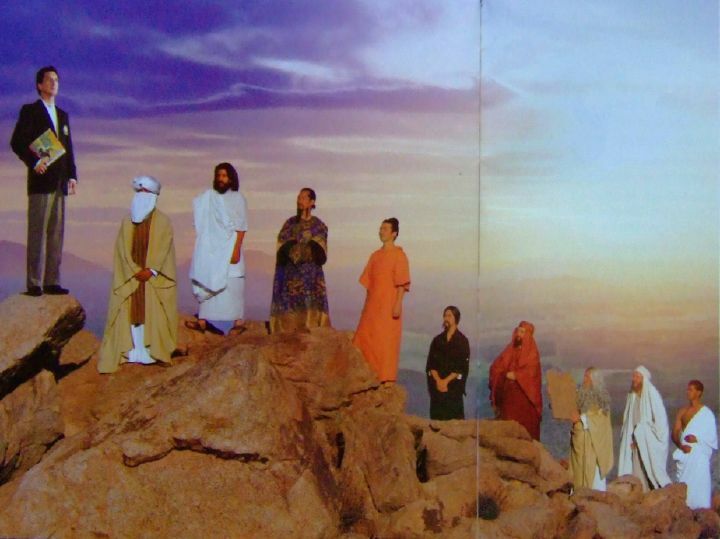 In this picture, a Scientologist (on the left) towers over (in order, left to right) Mohammed, Jesus, Confucius, Buddha, Lao-Tzu, Zoroaster, Moses and Abraham. (The last figure is not named, but may be Adam.) Higher level Scientology materials explain how Scientology is superior to all other religions (including Islam), because they are nothing more than "engrams" falsely implanted in our minds. 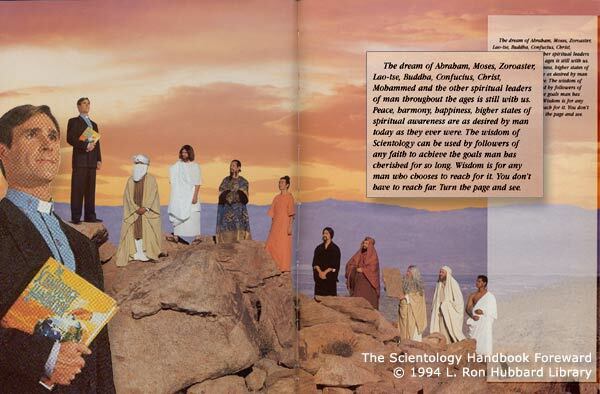 On the left is a close-up of Mohammed (along with Jesus and a Scientologist) taken from the picture above; and on the right is another version of the same photo, this time with a different Scientologist and different background colors. This second image was found at the Refund and Reparation site, and was originally taken from The Scientology Handbook. 19th-century German artist Theodore Hosemann created this painting in 1847, which is titled "Die Berufung Mohammeds durch den Engel Gabriel" ("The Calling of Mohammed Through the Angel Gabriel"). A reproduction of it was published in the December 20, 1999 edition of Der Spiegel magazine in Germany (but not properly attributed until a mention in the February 7, 2000 issue). A jpeg of the painting was posted at wikimedia. 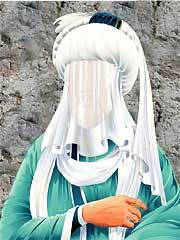 This Chilean scholastic site features a modern veiled portait of Mohammed -- a rarity in a non-Islamic country. 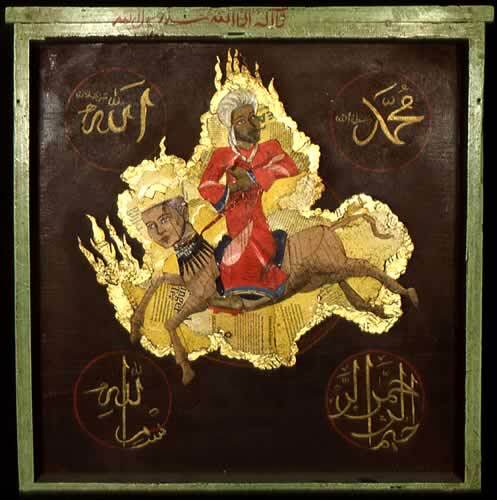 New York artist Christina Varga created this neo-Byzantine portrait of Mohammed (with Arabic calligraphy instead of a face) in 2002 as part of a triptych showing Mohammed, Jesus and Buddha which was displayed at The Cathedral Church of Saint John the Divine in New York City. The artist's caption for her Mohammed portrait says, "Mohammed the Prophet (peace be upon him) stands before the green domed mosque of Medina called the Prophet's Mosque. Because it is forbidden to represent his face calligraphy commanding all to maintain a pure body and spirit and declaring the greatness of Allah the one True God covers it. Mohammed's hands are in a position of Surrender - the definition of Islam. His halo represents the flames surrounding his body in Islamic iconography." Contemporary Marxist artist Erin Currier created this portrait of Mohammed; it now resides in a private collection. 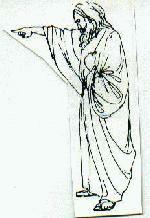 This 1930s-era glass painting from Senegal shows Mohammed's flight from Mecca to Medina in 622 A.D. 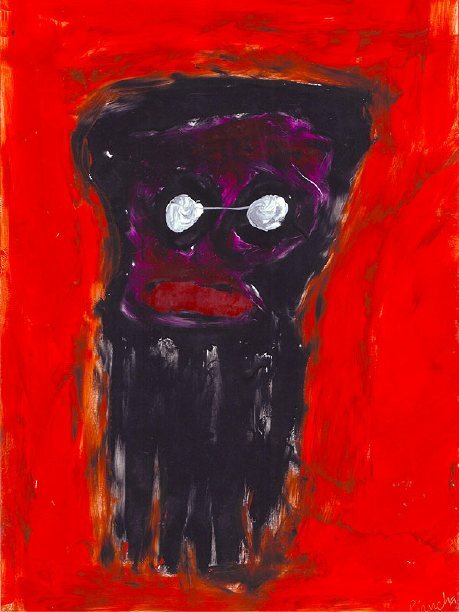 It's currently for sale at this online African art gallery. 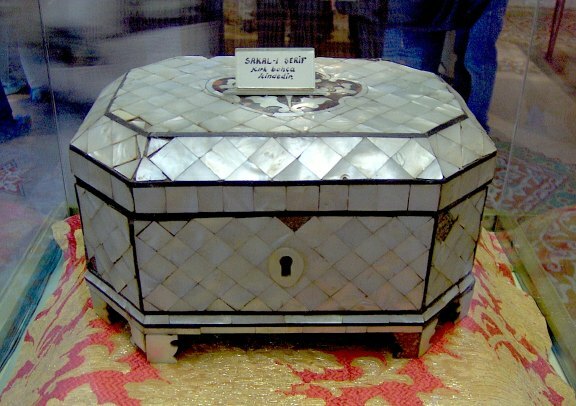 The Mevlana Museum in the Turkish City of Konya houses an extremely rare relic from Mohammed's body itself: this antique box contains what is said to be Mohammed's beard. 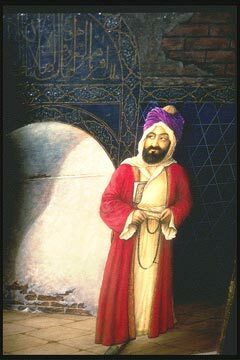 Tour guides at the museum say that such relics were taken from across the Middle East by Ottoman Sultans and brought back to Turkey to preserve them from fundamentalist Islamic sects (such as the Wahhabis of Saudi Arabia) that sought to destroy idolotrous Mohammed relics even centuries ago. These photos were taken and submitted by Archive reader "HypnoToad." (More photos of the museum can be seen here.) The museum also has a reliquary which supposedly houses one of Mohammed's teeth. The courthouse of the Appellate Division, First Department of the New York State Supreme Court used to feature a statue of Mohammed (seen here on the right) on its roof balustrade, among several other historical figures. The statue stood unchallenged between 1902 and 1955, when, as reported by Daniel Pipes, the Muslim community demanded its removal. 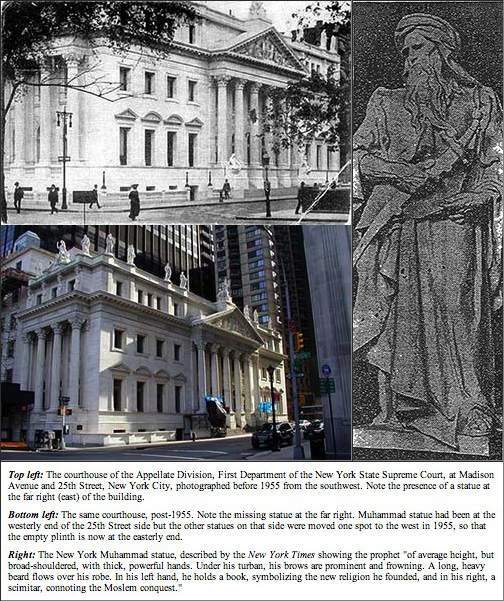 Unlike with the United States Supreme Court Mohammed depicted at the top of this page, the New York Courthouse Mohammed was dutifully removed in 1955 as a result of Muslim complaints, and the remaining statues repositioned. The photo shown here is the only known surviving picture of it. The Sermon of Mohammed. Oil painting on canvas by Italian artist Domenico Morelli, late 19th century. In the Museo Civico Revoltella, Trieste, Italy. 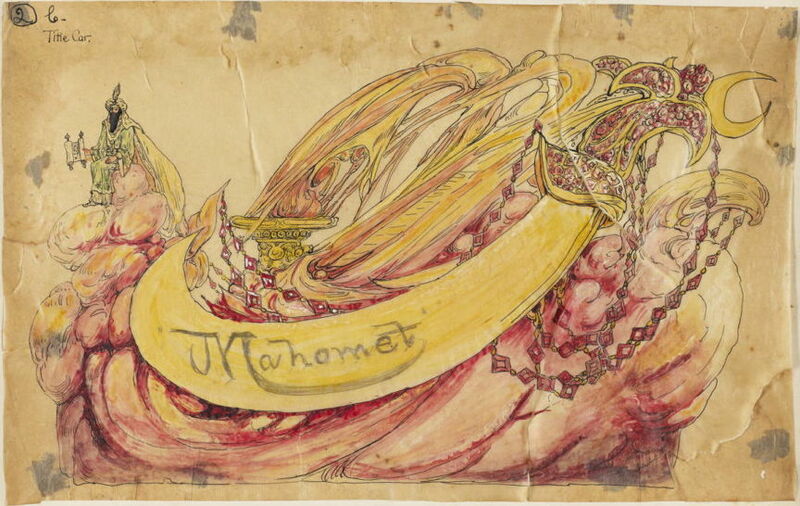 The Carnival Collection of the Howard-Tilton Memorial Library at Tulane University in New Orleans preserves the original float designs made by Jennie Wilde of the "Mistick Krewe of Comus" for the 1910 New Orleans Mardi Gras parade, which envisioned several elaborate floats in an Islamic theme, including this one for "Mahomet." 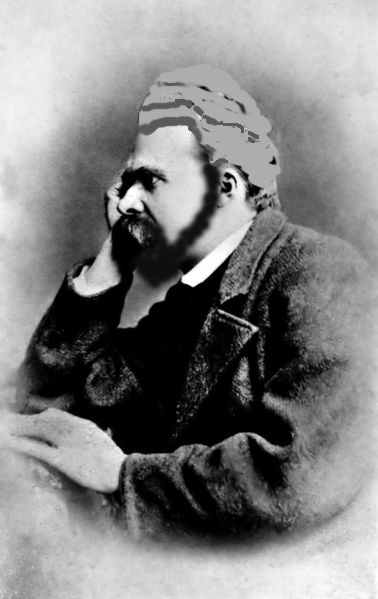 (A low-resolution version of this image has also been posted at wikimedia.) In all, there were five float designs that depicted Mohammed; the other four are presented below. 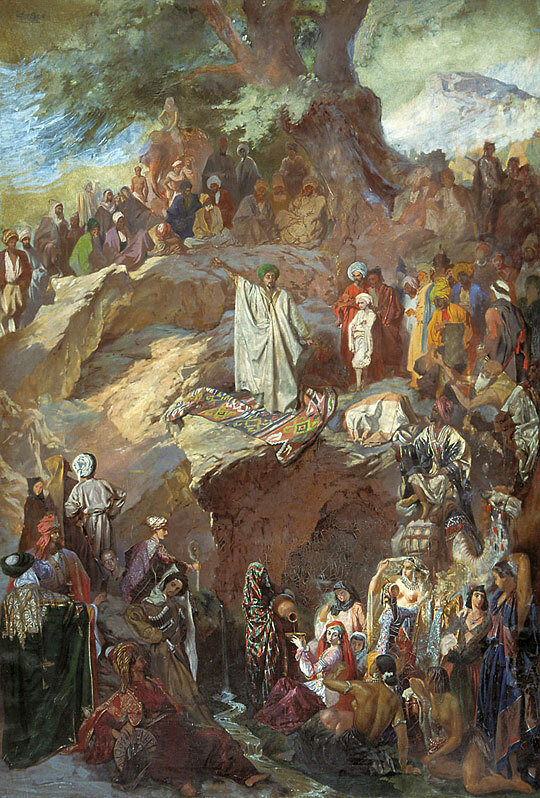 In this one, Mohammed is the figure at the upper left of the image. It is not known if any of these Islamic Mardi Gras floats were ever constructed, and if they were, whether or not they were photographed. 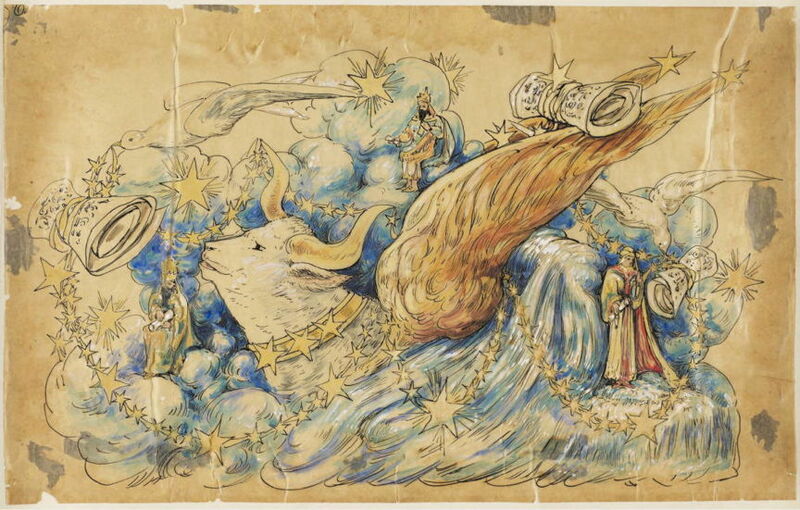 The next float design was titled "Al Borak"; the artist's notes say, "The animal brought by the angel Gabriel to convey the prophet Mahommad to the seventh heaven. The name means 'the lightning.'" 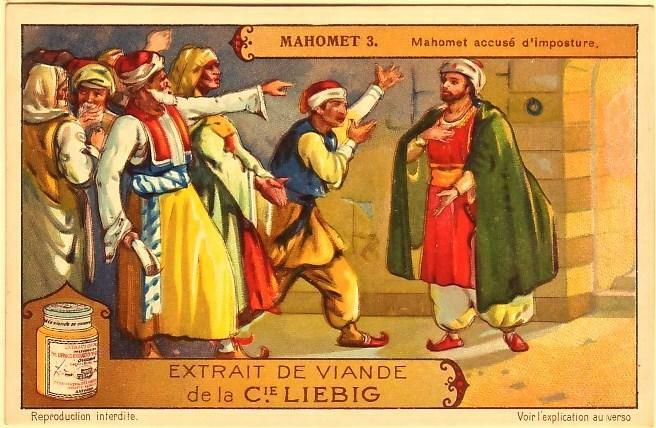 Mohammed is the figure at the far left. The third float design depicted The Hegira (Mohammed's flight from Mecca to Medina), and included several authentic details from Islamic scripture, such as the spider which spun a web to disguise the entrance of the cave where Mohammed was hiding from his pursuers. It's not entirely clear which figure on the float is Mohammed -- he is likely either the figure in red or the seated warrior in gold. The design called "The Koran" included a cow because, according to the artist, the Sura called "The Cow" was the longest Sura of the Koran. Presumably, the seated figure at the top of the float is Allah, the figure at the right is the Angel Gabriel who is receiving the text of the Koran from him, and finally conveying it to Mohammed, the figure at the left -- although these identifications are not definite. The last of the floats to possibly depict Mohammed is titled "The Place of Adoration," with Mohammed apparently the seated figure with a beard at the lower left of the image. Although the image did not include any notes from the artist, the notion of a "place of adoration" in Islam refers to a spiritual mindset one enters when praying. 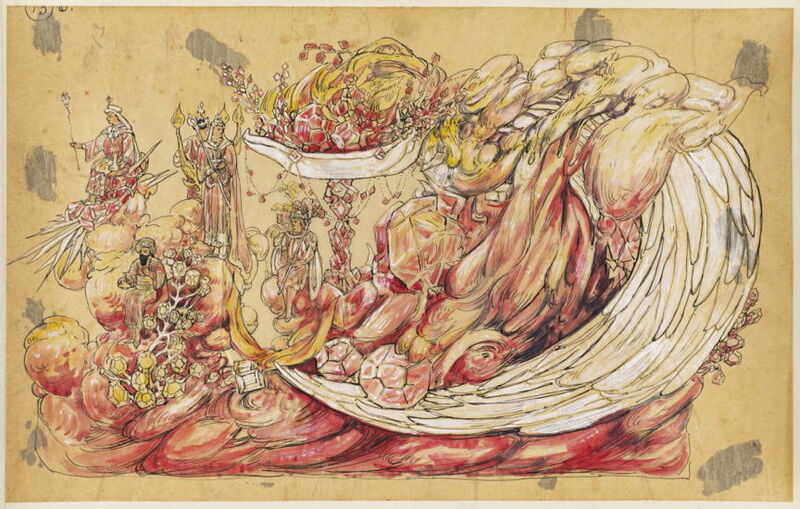 There were 15 additional Mistick Krewe of Comus float designs made by Jennie Wilde in 1910, but as far as can be determined none of them included depictions of Mohammed. 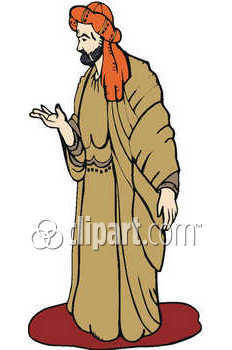 This modern drawing of Mohammed was used in public school instructional materials in Spain. 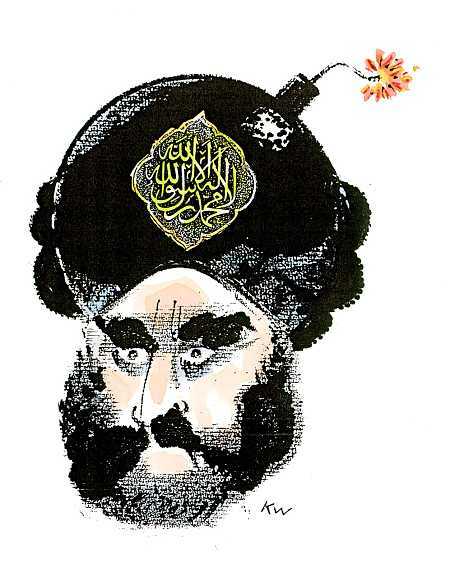 The Spanish newspaper El Mundo has this mohammed portrait on their Web site in a section about the history of Islam. 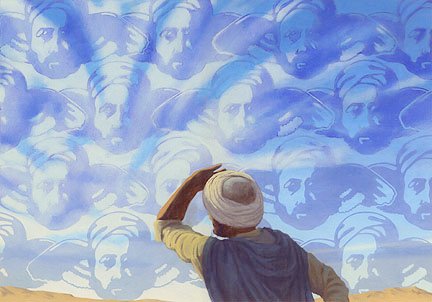 This 20th-century painting from a Shriners' Hall in Maine shows Mohammed receiving a vision. 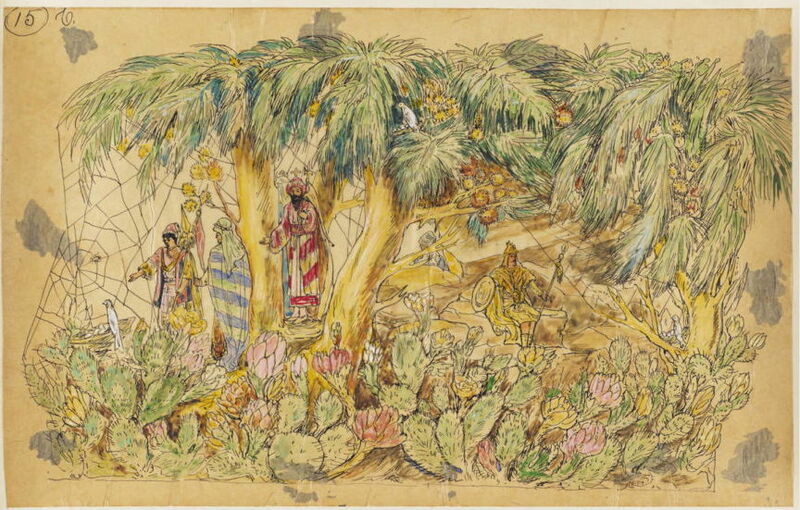 Another Shriners' painting showing Mohammed (in the red robe on the right) being comforted by his uncle as he hides from Meccans during his flight to Medina. 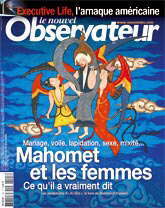 Recent issue of French magazine Le Nouvel Observateur with Mohammed on the cover. The magazine has extensive coverage of the Muslim reaction to the Danish cartoons but make no mention of its own Mohammed cover. 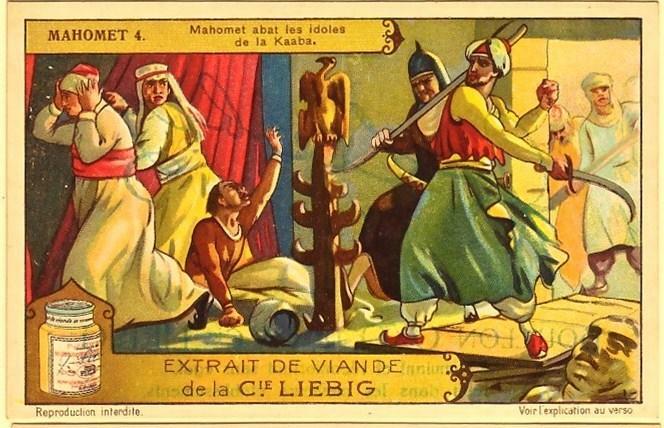 This reproduction is a bit small, but it shows Mohammed destroying the idols at the Kaaba in Mecca. It is taken from Manly P. Hall's occult guide The Secret Teachings of All Ages, which incorporates ideas from many religions, Christianity and Islam among them. This painting was originally done by Russian symbolist painter and Theosophist Nicholas Roerich in 1932, and is entitled "Mohammed the Prophet," showing Mohammed receiving a vision. It has appeared in the literature of various Christian groups. 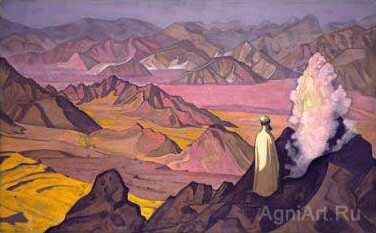 Roerich also made an almost identical painting called Mohammed on Mount Hira that is much less well-known. 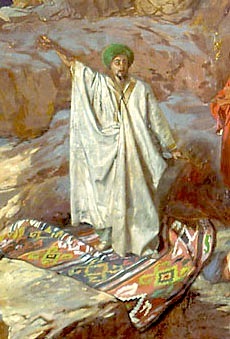 Painting of Mohammed preaching. By Russian artist Grigory Gagarin, painted sometime in the 1840s or 1850s. Source: Wikimedia Commons. The image on the right is a detail from the full painting, showing just Mohammed. 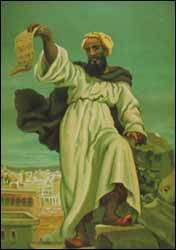 This 1865 engraving by Alonzo Chappel entitled "Mahomed the Prophet Expounding His Creed" appeared for sale at eBay in 2013, but has since been bought and the listing taken offline. The original image size is 5 1/2" x 7 3/4". 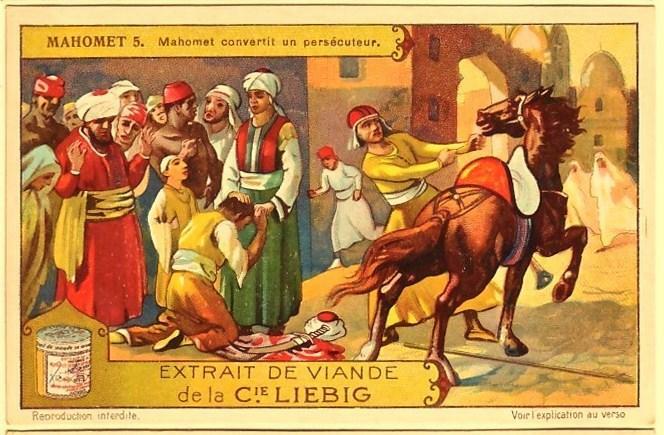 As mentioned near the top of this page, in 1928 Liebig's Extract of Meat Company issued a series of six advertising trading cards illustrating important moments in the life of Mohammed. The cards came in both German and French (and possibly other languages as well). 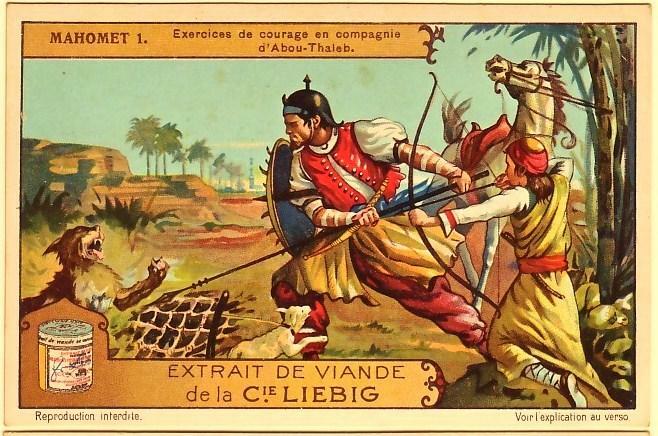 A collector has uploaded these images of all six of the French-language cards to the Internet Archive. All six are presented here. The Humanist site "Freethunk" features this page of eight Mohammed clip-art images (as well as a few Mohammed cartoons that are included on the "Recent Responses" page of the Archive). 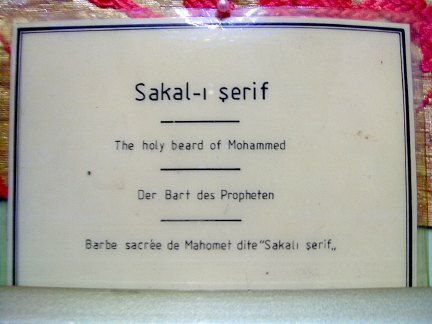 This online clip-art gallery also offers several copyright-free line drawings of Mohammed, including the one shown here. 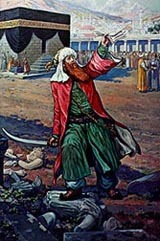 Modern-era painting showing Mohammed. Artist unknown. 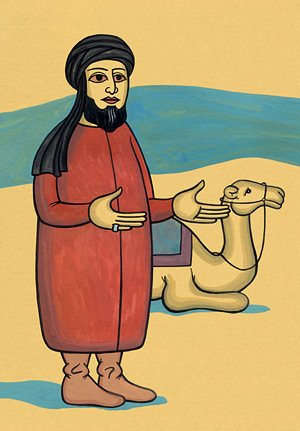 Contemporary stylized drawing of Mohammed. 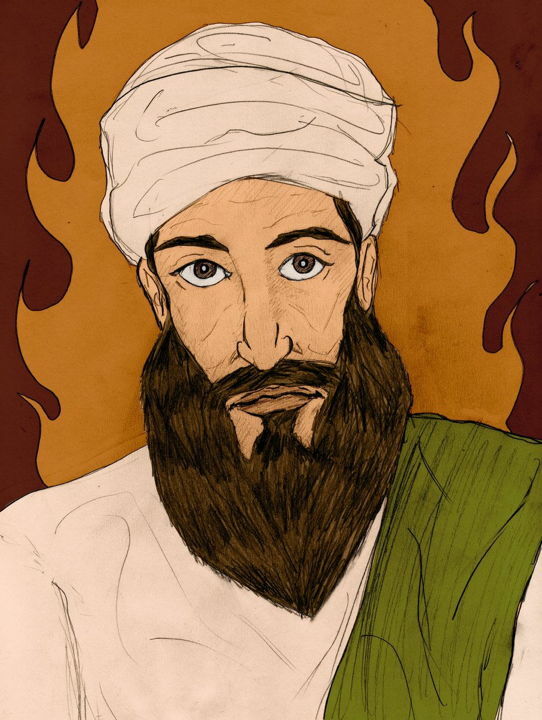 This modern line drawing apparently of Mohammed can be found on this site. 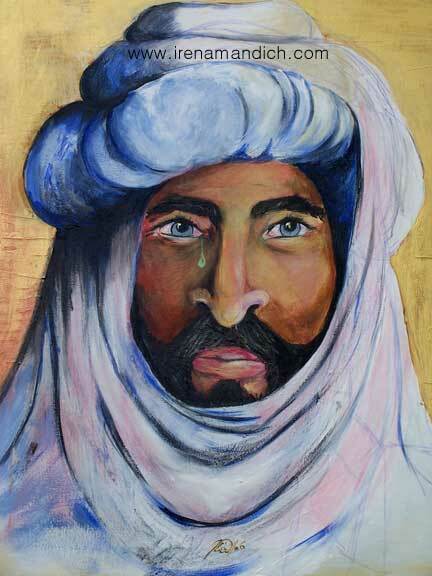 Artist Irena Mandich recently painted this portrait of Mohammed crying (entitled "Mohammad, Salaam"). This attempt to show Mohammed as sad about the violent Muslim response to the controversy could itself be seen as being even more offensive to Islamic sensibilities. 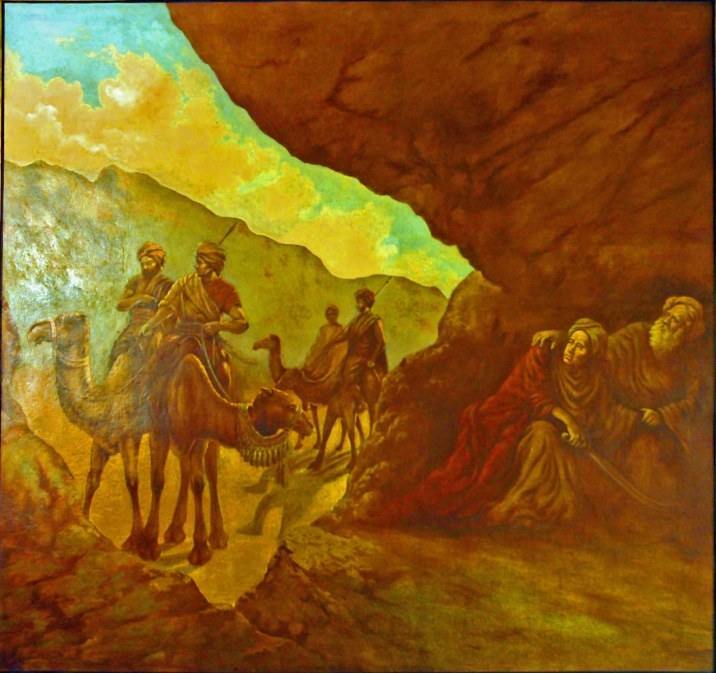 Artist William Fahey painted this picture entitled "Muhammad and the Angel." It depicts the prophet's vision of the Angel Gabriel, based on the description in the "Life of the Messenger of God," by Ibn Ishaq. 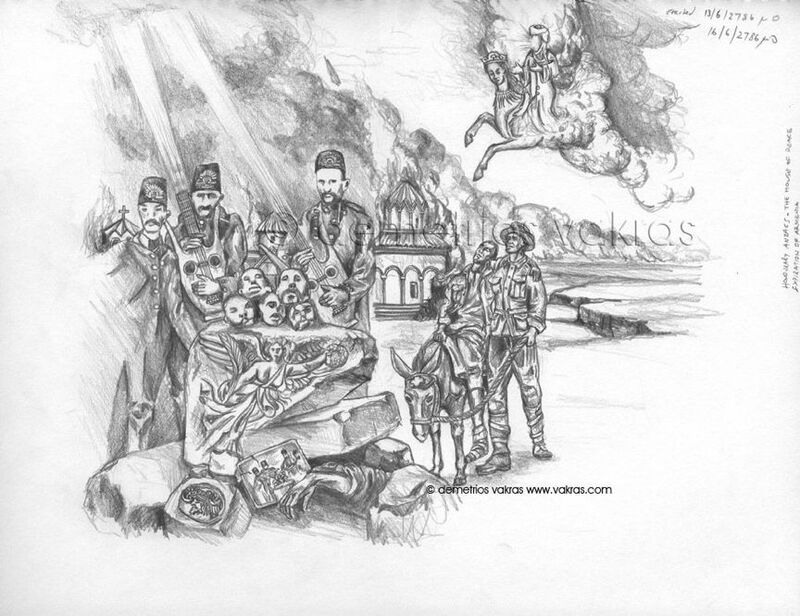 Australian atheist artist Demetrios Vakras drew this detailed allegorical sketch, titled "Honorary ANZACs in the House of Peace - Expiration of Armenia, 2010," and posted it here and here on his Web site along with an explanation of the work's many symbols and references. 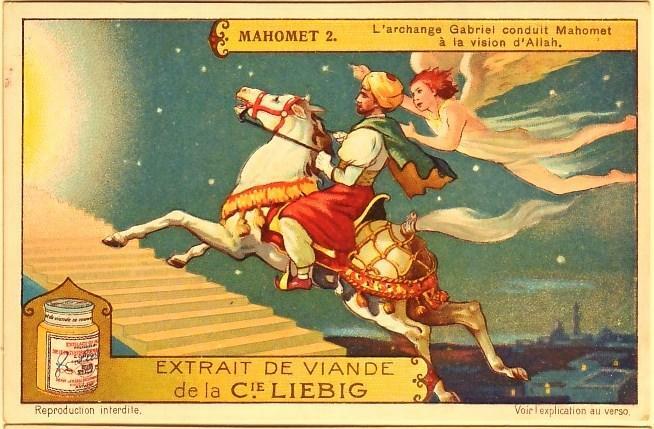 Mohammed is visible in the upper right corner of the image riding on Buraq, symbolizing the ideology of Islam that is at the ultimate root of the Turks' genocide of the Armenians in 1915, which is depicted at the lower left with Ottoman soldiers posing with the heads of decapitated Christian Armenians. 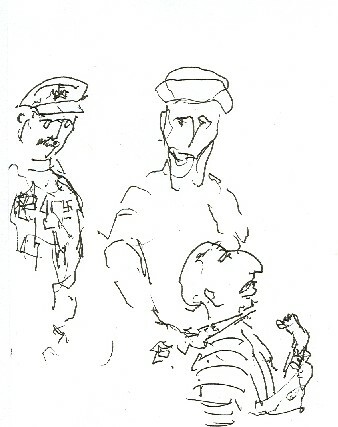 The "ANZAC" in the drawing's title reflects the artist's disgust that the nation of Australia does not condemn the Armenian genocide to the same degree that it condemns the later Holocaust of the Jews, even though Hitler was inspired by the Turks' earlier example of "getting away with" genocide. In 2006 a march to commemorate the Australian military campaign in Turkey during WWI was opened to descendants of the Australians' enemies, the Turks, because they were characterized as being "honorable opponents" -- even though at the exact same historical moment that the Turkish army was battling the ANZAC (Australia and New Zealand) forces, they were also committing genocide elswhere in Turkey, and thus ought not be deemed "honorable" in the artists' opinion. Thus, with bitter irony, he places ANZAC insignia on the Turks' fezzes and he sarcastically awards them the title of "Honorary ANZACs." In a related incident, the artist Demetrios Vakras was later financially ruined after he and his partner got into a seemingly trivial dispute with a gallery owner over an exhibit of works critical of Islam and other religions, which nonetheless resulted in a $450,000 fine being levied against Vakras for "imputations" about the owner, even though they were true. 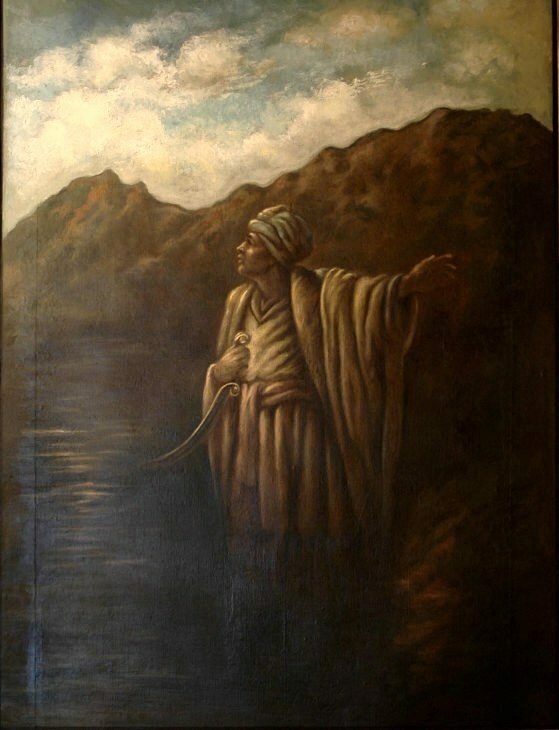 The Galician artist Alfredo Pirucha includes in his online gallery this portrait of "The Prophet," most likely Mohammed. Pirucha's intentionally childish style adds a layer of irony and mockery to his works. This brass ashtray, discovered by a reader at a garage sale in Los Angeles, appears to be a representation of a bearded male figure with his face covered, sitting on a camel or horse. It might, or might not, represent Mohammed. 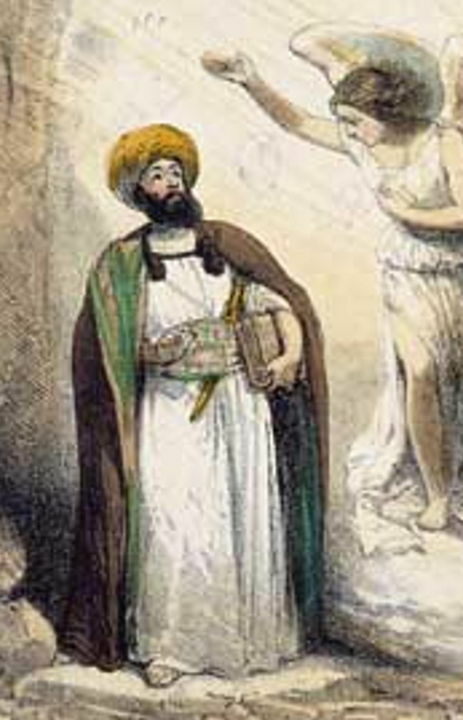 This apparent portrait of Mohammed was part of an artwork displayed for a short period in 2007 in the window of a framing store in Berkeley, California. 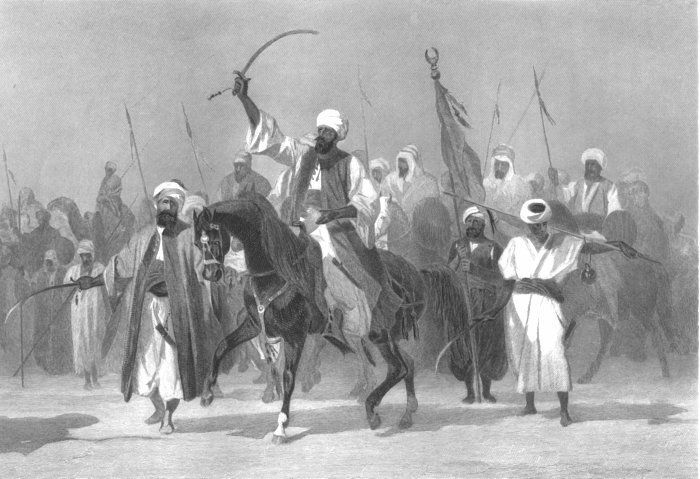 This graphite or charcoal rendering of Mohammed carrying a spear and a copy of the Qu'ran and Hadiths is titled "False Prophet" and was found online in 2006 on a Serbian Web site. 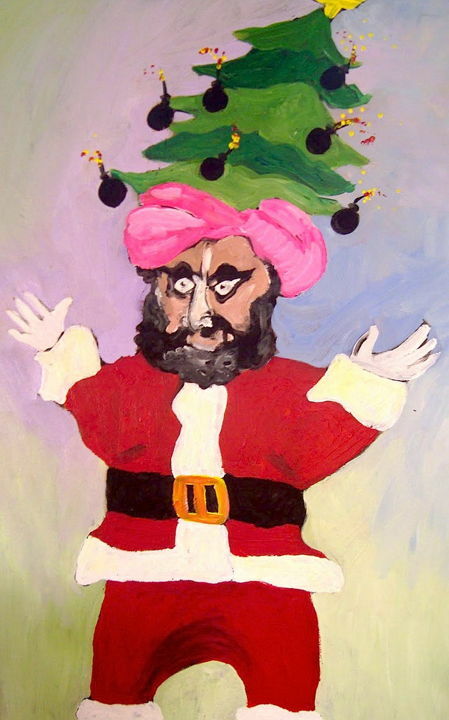 The "Kokkedal Bad Santa" series of Mohammed portraits began in the Christmas season of 2012 when the governing board of the Egedalsvænge housing complex in the town of Kokkedal, Denmark voted to not display a Christmas tree or have its popular neighborhood Christmas celebration for the first time ever, which ignited a flurry of public outrage in Denmark after it was discovered that a majority of the voting boardmembers were Muslim and who had earlier that year spent the neighborhood's communal funds on a much more expensive Islamic Eid holiday celebration, even though most of Egedalsvænge's residents were not even Muslim. 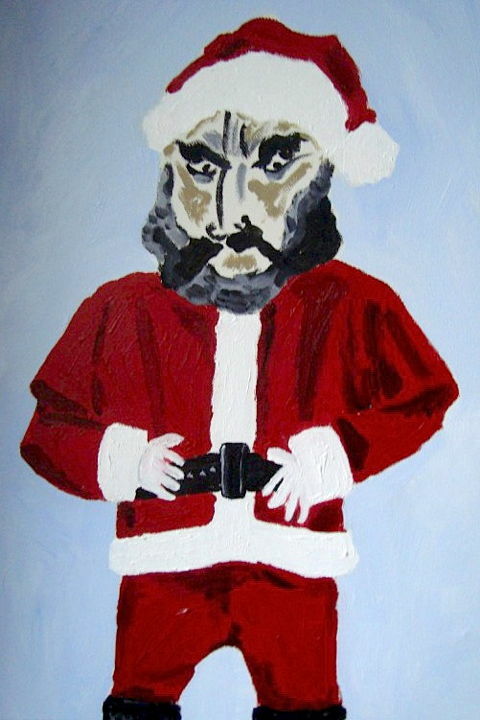 The media declared the incident to be part of the "War on Christmas" and Danish artist Uwe Max Jensen lodged his own protest by painting a work he entitled "Christmas in Kokkedal" ("Jul i Kokkedal" in Danish), shown above. He then placed the painting for sale at the art auction house Lauritz.com -- and was shocked when Lauritz refused to sell his piece because it too closely resembled the infamous "Mo-Bomb-Head" Jyllands-Posten cartoon by Kurt Westergaard and they were therefore likely afraid of violent reprisals from Muslims were they to offer a "portrait" of "Mohammed" for sale, even if it wasn't labeled as such. 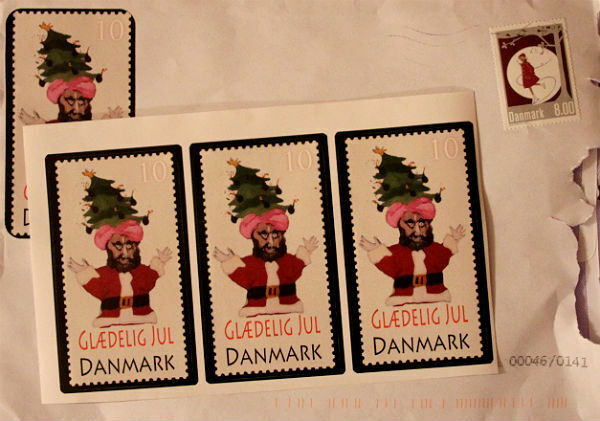 Jensen was so upset at being censored that he painted a second follow-up version titled "Bad Santa (Christmas in Egedalsvænge)" ("Bad Santa [Jul i Egedalsvænge]" in Danish), seen here, which was more obviously based on the Westergaard cartoon and featured a Christmas tree in Santa/Mohammed's turban festooned with bomb-ornaments. 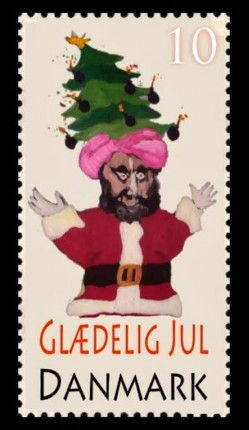 This second painting received so much publicity that he made commemorative Christmas seals (not actual postage stamps, but decorative seals traditionally affixed to envelopes containing Christmas cards) from a mirror-image of it and sold them in blocks of 20 to collectors and free-speech advocates. In the nation of Sweden there is a contemporary urban folk custom of placing in the center of "roundabouts" (the circular traffic islands in the middle of major intersections) whimsical homemade sculptures representing pet dogs. The sculptures, which are fairly commonplace in Sweden, are called "roundabout dogs" (rondellhund in Swedish). 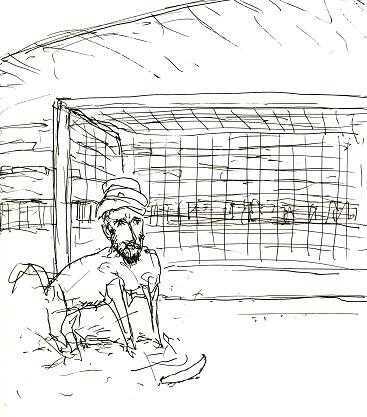 In the summer of 2007, Swedish artist Lars Vilks made some paintings of Mohammed as a roundabout dog; after they were rejected by two art galleries wary of controversy, a sketch based on one of the paintings ended up being published in a small local Swedish newspaper, Nerikes Allehanda. Incredibly, this ignited an international furor, with protests, diplomatic quarrels, and threats of violence. 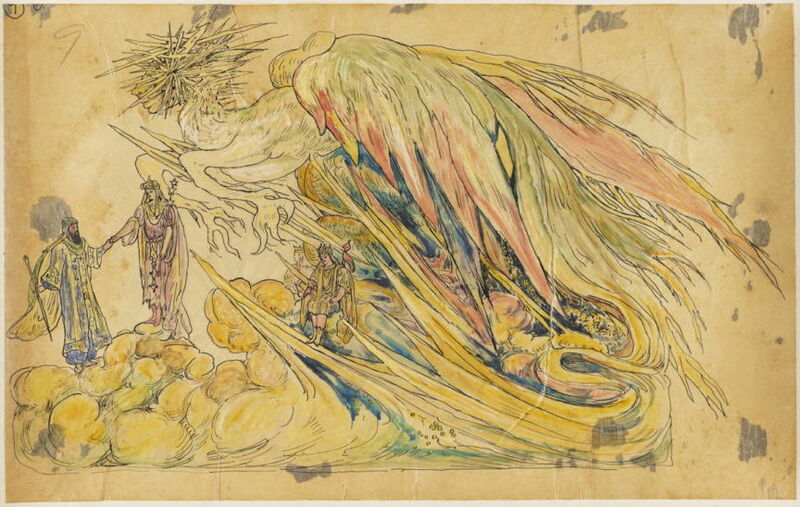 The original sketch, seen above, was also posted on Vilks' blog. Over the following month, Vilks continued to draw additional sketches of Mohammed as a roundabout dog, as a regular dog, and as a human in various satirical settings, and posted them to his blog on July 21, July 22, July 23, July 25, July 26, July 27, July 29, July 30, August 11, August 13, and August 18. The Lars Vilks Muhammad drawings controversy, at wikipedia. Newspaper article in Swedish about the beginnings of the incident. Turkish hackers attacked Swedish Web sites as retaliation for the roundabout dog Mohammed.